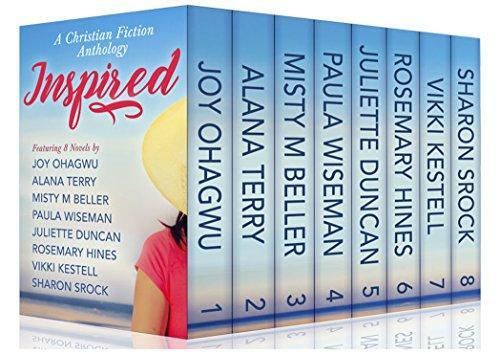 Grab your copy of INSPIRED- A Christian Fiction Anthology by Bestselling Christian Fiction Series Authors! *Limited time only*RED by Joy Ohagwu-Gripped by shock at the site of a presumed routine package delivery run, business woman and entrepreneur Ruby "Red" Masters just saw a woman die. And she discovered The New Rulebook, something she knew nothing about. But it knew everything about her, enough to frame her for murder. ***UNPLANNED by Alana TerryWhen Kennedy Stern’s childhood pastor asks her to volunteer at his new pregnancy center, she carves time out of her rigorous college schedule to promote the cause of the unborn.After receiving a disturbing call from someone far too young to carry a child, Kennedy can no longer blindly hide behind the pro-life platitudes she grew up believing. She resolves to locate the unknown girl but winds up entrenched in a mystery that grows more convoluted as it unfolds. ***THE LADY AND THE MOUNTAIN MAN by Misty M. BellerLeah Townsend, a recently orphaned heiress, flees Richmond after discovering her fiancé’s plot to kill her after their wedding. She needs a safe place to hide, and finds herself accepting a newspaper marriage proposal from a God-fearing young rancher in the Montana Territory.But when an accident forces Leah to stay at the ranch for seven more months, can Gideon protect his heart from a love he doesn’t want? Has Leah really escaped the men who seek her life? ***CONTINGENCY By Paula WisemanBobbi Molinsky had it all--a successful husband, two great boys and a job she loved-- then she opens a stray email from the newest attorney at Chuck's firm and is blindsided by the discovery of his extramarital affair. An angry confrontation leaves her with the broken remains of their eighteen-year marriage.Guided by their pastor, Chuck commits to do whatever it takes to win Bobbi back, but she is wrestling with much more than his infidelity. ***TENDER LOVE by Juliette Duncan- After her long-term relationship falls apart, Tessa Scott is left questioning God’s plan for her life, and she’s feeling vulnerable and unsure of how to move forward. Stephanie, Tessa’s housemate, knows the pain both Tessa and Ben have suffered. When she is inadvertently instrumental in setting up a meeting between them, there’s no denying that they are drawn to each other, but will that mutual attraction do more harm than good? ***OUT OF A DREAM by Rosemary HinesMichelle Baron should be reveling in her new life in Sandy Cove, Oregon. From the outside, it all looks idyllic. A newlywed settling into a quaint coastal town, her husband establishing himself as a junior partner in a law firm—what more could she want? But a series of disturbing nightmares haunts Michelle. Her quest to understand these dreams leads her to the New World bookstore, where she begins a spiritual journey that will challenge her Christian heritage as well as her marriage. ***STEALTHY STEPS by Vikki KestellGemma Keyes is an ordinary, unexceptional young woman with a lackluster life until an overheard conversation ends her budding career—and her loyalty to an old friend puts her very existence in jeopardy. ***CALLIE by Sharon SrockShe can’t escape the mistakes of her past…Callie Stillman has done everything she can to bury the memories of a tiny, baby-sized coffin. She lives life one day at a time, basking in the love of a good man and doting on her grandchildren. Until she crosses paths with a little girl who is obviously in trouble—but tries to hide it.